1 Can Herbs Flush Cellulite? Used as an accent flavor for curries and meat, kasoori methi are fenugreek leaves used in Indian cooking. Their taste is a cross between celery and fennel with a bitter bite. Although used in small amounts, kasoori methi may help you get more fiber, calcium and iron. Kasoori methi is used in a number of Indian dishes in either dried or fresh form in varying amounts. One tablespoon of dried kasoori methi contains 7 calories. The number of calories the dried leaf adds to your dish depends on the amount used. If you consume 2,000 calories a day, 1 tablespoon meets less than 1 percent of your daily calorie needs. Knowing the calorie content of different types of foods, even herbs, can help you track your intake for weight management. One tablespoon of dried kasoori methi contains 1 gram of carbohydrate and 0.5 grams of fiber. A 1-tablespoon serving of kasoori methi is not a significant source of carbs or fiber, but the herb can help you meet your daily fiber needs. Most Americans don't get enough fiber in their diet, says the Academy of Nutrition and Dietetics. On average, Americans get about 15 grams of fiber a day, but need 14 grams of fiber for every 1,000 calories consumed, or about 25 grams for women and 38 grams for men. Adding a few tablespoons of kasoori methi to various Indian dishes to add flavor may help bump up your intake. Getting more fiber in your diet helps with weight control and may lower your risk of heart disease. Like carbs and fiber, a 1-tablespoon serving of kasoori methi is not a significant serving of protein or fat. One tablespoon is virtually fat free with 0.5 grams of protein. Protein and fat are essential nutrients your body needs for good health. Protein supports immune health and repairs tissue. Fat provides energy and is necessary for the absorption of fat-soluble vitamins A, D, E and K. Although the fenugreek leaves are not a significant source of these nutrients, the herb is used in dishes such as chicken methi and methi mutton, which provide protein and fat. 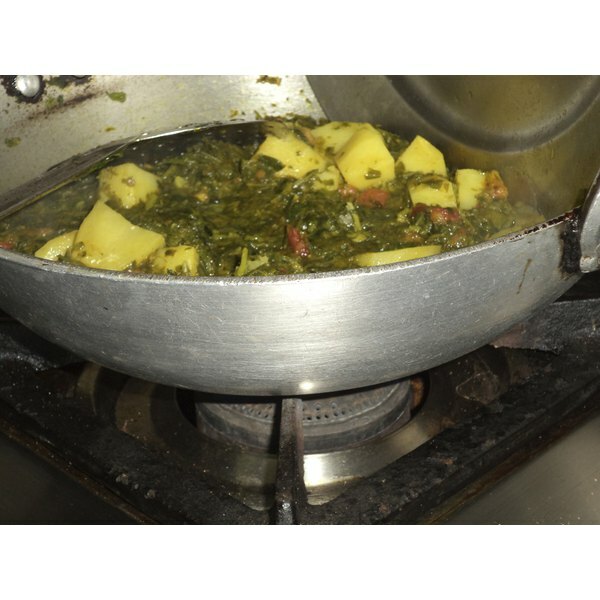 Kasoori methi is rich in a number of vitamins and minerals. The fresh leaves contain significant amounts of vitamin C -- 220 milligrams per 100-gram serving -- but drying the leaves reduces the amount of vitamin C by as much as 85 percent, according to a 2012 review article published in Food Processing & Technology. Drying has less of an effect on calcium and iron content. A 1-tablespoon serving of dried kasoori methi contains 3 milligrams of calcium and almost 1 milligram of iron. Vitamin C, calcium and iron are all important nutrients for good health. Vitamin C is necessary for wound healing and immune health, calcium keeps your bones healthy and strong and iron assists with the transportation of oxygen throughout your body. Adults need 90 milligrams of vitamin C and 1,000 milligrams to 1,200 milligrams of calcium a day and adult women age 19 to 50 need 18 milligrams of iron and men and women over 50 need 8 milligrams of iron a day.